We’ve been grilling like fiends all summer. It’s been hot and we’ve been so busy that by the time I get around to cooking it’s late and the easiest thing to do is to light the grill. Mostly I’ve been using store bought barbecue sauce to glaze, or marinate, the meat. 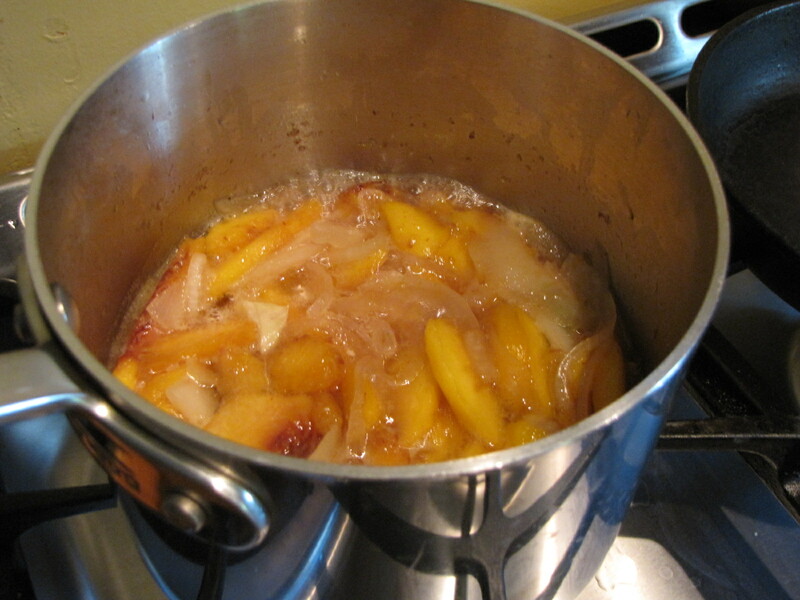 However, a big bowl of peaches prompted this experiment – which, I have to say, turned out pretty great! Personally I like the combination of sweet and meat. Mark? Not so much. This sauce pleased both of us. The sauce is very easy to make. 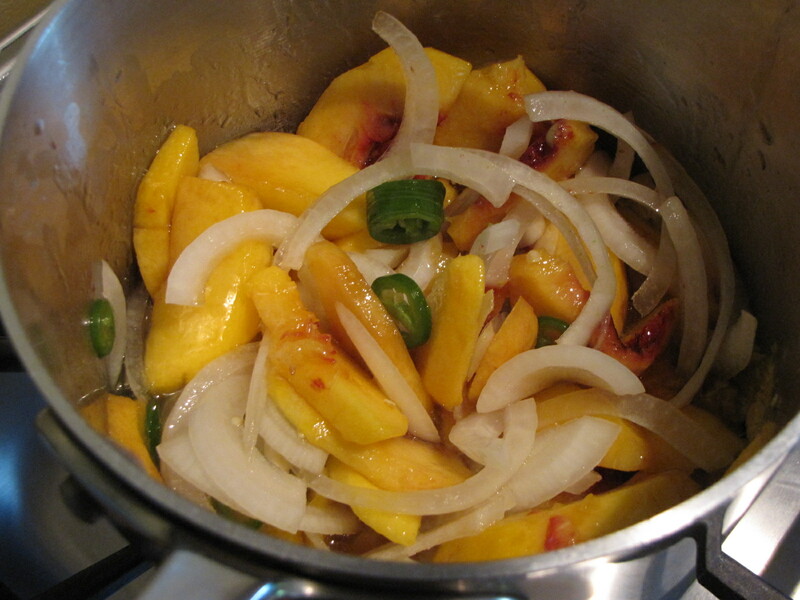 Simply combine oil, onion, jalapeno, garlic, peaches, bourbon, apple cider vinegar, maple syrup and mustard. Simmer till soft, then puree. 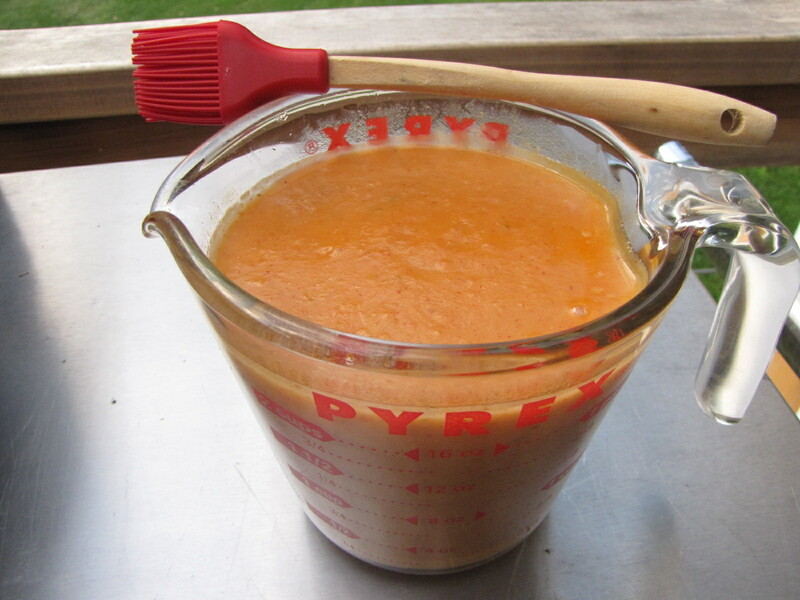 Once the sauce is pureed, you can easily adjust to suit your tastes. Add some sriracha or hot sauce if you want more heat. Add more vinegar or ketchup if you want more tang. If sweet is your thing, then you can add a bit more maple syrup or brown sugar. That’s it. I’ve used this sauce on ribs, to marinate chicken thighs in (and then grill – delicious!) and in the slow cooker with a small pork loin that we served on hard rolls with slicked dill pickle. 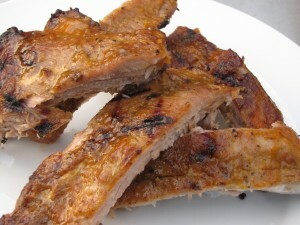 Grilled ribs with Sweet Peach and Bourbon BBQ Sauce. I’ve included the recipe below so you can print it out if you like. The recipe makes about two cups and will last in the refrigerator, covered for up to two weeks. This also freezes well. I hope you give it a try. Tell me what you think in the comment below and feel free to share links to your favorite BBQ sauce recipe if you like. 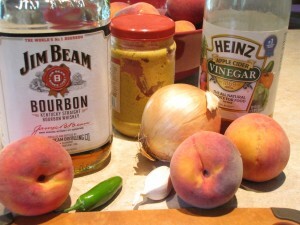 Barbecue sauce made with fresh peaches and bourbon. Good for grilling and marinating pork or chicken. Place all the ingredients in a medium sized saucepan. Simmer over medium heat until all ingredients are soft - about 25 minutes. 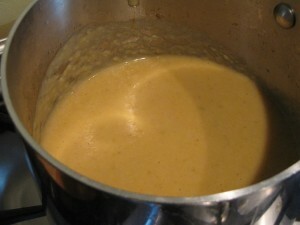 Blend using an immersion blender or in a blender. Taste - and adjust to your liking. I have no idea that you could put bourbon in a BBQ sauce. This looks so yummy. Peaches? The only place I see peaches is in the title. How many should I use in this recipe? Would love to try it. Thanks. Awesome catch! Not sure how I messed up but I have updated the recipe so it now reads correctly. You’ll need 3 large ripe peaches – pit, peel and slice. Thank you!! !